Yes we should definitely do a swap soon, let me know if you have any ideas! This is such a cool idea! I wish I had a swap buddy but I'm useless when it comes to diy! Lol. As for not seeing my parents for so long, it's hard at times but you get kind of used to it after a while. That's cool how youre in NZ! Ive always wanted to go but never gotten around to it. I'm from Sydney! How long are you staying here for? My favorite I think is the scarf...I'm obsessed with birds! Lovely package of wonderful items! I've never done a swap but it sounds fun! Those bird magnets are too cute! And by the way, when I said 'Chucks' in my post, I meant Chuck Taylor tennis shoes. Wow what a great swap Sadie!! I have been doing some swaps lately after finding out about cut out and keep from your blog! 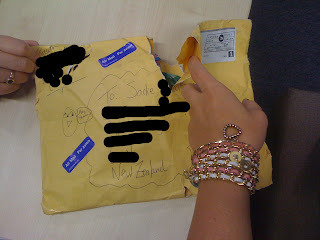 I just sent off a candy swap to Holland this week and am eagerly anticipating my package from them! Yesterday in London I went to an international candy store and was amazed at all the yummy Australian chocolates...you seem to have so much more mint and coconut there (my 2 fave flavours), how lucky! it got me thinking if you're missing any British choc perhaps you would like to do a choc/candy swap? it's cool if you don't but just thought I'd check incase!! I'm so glad you like everything! MAN, that was a big hole! Thank goodness everything stayed in the envelope. I meant to get a picture of how cute the goodies you sent me were wrapped, but I was too eager to open 'em and didn't have my camera with me. hi sadie! love your scarf :) great stuff! swaps must be great love all the things you got soooo cute! the magnets are adorable and the scarf and necklace are really pretty! 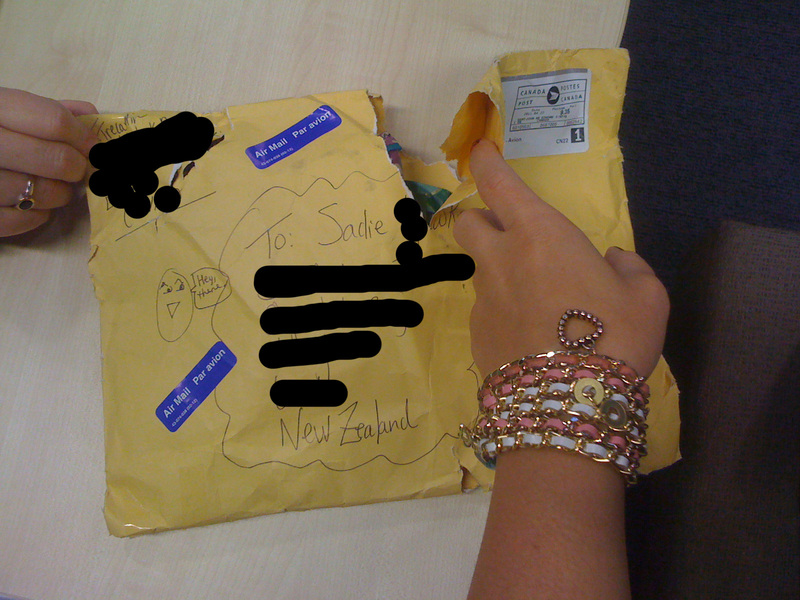 oh wow such lovely things from the swap sadie :-) i can't believe how big the hole is in the package though!! my mum ordered some wool from hong kong and the parcel came with a massive hole in too, but luckily nothing was lost or damaged. I love seeing the results of all of these swaps you do- getting packages is one of my favourite things, it's just one of those simple pleasures... I must have to find my way into one of these circles :) Love that purple bird necklace, it's adorable. it's so nice that your DIY is being featured. i love all the cute bracelets you're wearing by the way.